[/size][/font][font=Georgia]A standalone fire mage companion suitable for your mid/late-game adventures. 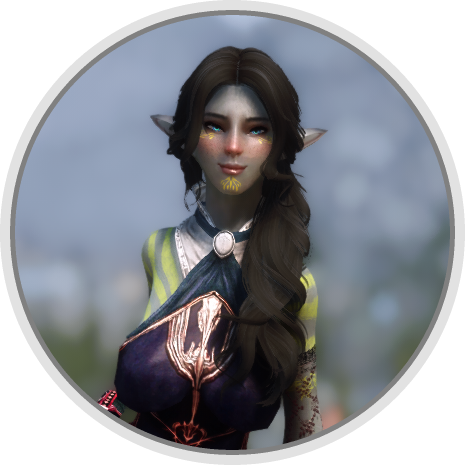 Ruti is a half-breton half-dark elf girl, whose parents were fire magic researchers and taught her everything they had uncovered. Her mother died when Ruti was still of very young age, and her father went missing after an assault on her village by marauders. After running far from the village, she found some survivors from the attack and sailed away on a boat with them. Even with the harsh tempest creating huge waves, the dark elves thought they were safe from harm, but they didn’t expect a whale to collide with their ship, leaving only Ruti on board, knocked out. The last thing she remembers after this was waking up in New Gnisis Cornerclub, in Windhelm. Ambarys Rendar had found her wrecked boat around the icy coasts, and saved her. She now aims to becoming strong enough to find her father, discover who the looters were, and destroy them. With the Dragonborn at her side, Ruti feels a lot more confident in her journey. I do plan to make a quest mod involving her story in the future.